One of the most talked about topics are health and lifestyle issues and weight loss. In America, over 50% of the people are obese. Obesity is a reality for anyone with a body fat mass of over 20% and excess weight of 15%. Losing the excess to get to the ideal weight is perhaps one of the most difficult things to accomplish besides nicotine addiction. This is because of food addictions, depression, and lifestyle work and activity habits, which are far too often also a socially and a economically related problem. On top of it, we are being brainwashed into believing that we can regulate our weight with short cuts. We eat too much, we don't exercise, we eat wrong, we are too comfortable, and we have gotten used to an unhealthy lifestyle. How can I get out of the vicious cycle of my obesity? Dieting in combination with exercise is still the best way to lose weight safely. However it is essential to ensure that the nutrients that are taken in are absorbed with ease and can be used with maximum efficiency. A fruit and vegetable smoothie is one of the tried and true methods of taking in good nutrition that is easily absorbed through the digestive system, and with today's modern high performance blenders, the process of creating tasty nutritious drinks, purees and even low calorie desserts is almost effortless. Exercising builds muscle mass while eliminating fats. The heat generated during a workout means that fat is used to produce energy. However the nutrition taken in must be able to be used efficiently and this nutrition must replace what is being lost on a daily basis. The body will use the nutrients that are the easiest to absorb and transport, and smoothies offer the perfect solution to the problem of easily digestible foods. A 3 hp blender can turn the most bland of vegetables such as kale, spinach, celery and cabbage into a tasty concoction that contains much needed vitamins and minerals. Those beginning a diet and exercise regimen because of health related problems (Diabetes | Chronic Pain | Depression | Energy issues) can benefit enormously through the intake of fruits and vegetables that are pureed. The nutrition from blended up raw food / vegetables are very easily processed by the intestines and insure that most of the vitamins and minerals reach every cell in the body. Raw smoothies made with fresh vegetables and fruits are perfect for those wanting to keep their nutritional intake high without the risk of health problems associated with added or artificial ingredients. Digestion is the key to nutrient absorption. Unless the intestines and transport system is functioning normally the body cannot make use of many of the nutrients available in even the finest produce on the market. The digestive system is made up of cells just like the rest of the body. When they are fed with good nutrition they are more capable of sending the nutrition from green smoothies and other healthy foods to the organs, skin, bone marrow and muscle tissue. Many with health concerns, including diabetes and heart issues are advised by their doctor to lose weight and take pressure off the heart and circulatory system. Crash diets are generally regarded as dangerous for those with certain medical conditions, but a combination of diet and exercising is highly recommended. One of the best ways to begin a weight loss program is to take in raw nutrition in a manner that allows optimum absorption. A weight loss smoothie is a combination of fruits and vegetables that contains all the vitamins and minerals required on a daily basis and is easily digested because the food has been pureed. This means that the nutrients are more easily absorbed through the intestine, and are more likely to be used by the body to maintain healthy cells. 3 HP Smoothie Power Machines are designed to puree foods into delicious, easy to drink green smoothies, as well as soups, sauces and even nut butters. Those high power blenders (shown at Costco for example) can handle even the roughest of vegetable matter. 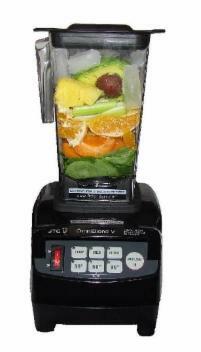 The OMNI is also a 3 hp blender, and it does the same things, with the major difference that it costs a lot less. These blenders turn raw vegetable ingredients into a semi liquid that is easy on the stomach and intestinal tract. This type of food intake, when combined with exercise, is the proper way to lose weight safely because the body is still receiving all the nutrition it needs on a daily basis. You need to however watch your Blood Sugar level. Remember, everything you blend, including the fruits and vegetables, becomes more potent as it is quicker absorbed into the body. If your sugar level is a challenge, you may want to consider the use of more vegetables in your smoothies, and less fruits. Raw smoothies are easy to create, and hundreds of delicious recipes are now available for those wanting to get started on a natural weight control program. These recipes have been given thumbs up by many health experts because when certain fruits and vegetables are consumed in combination they are more effective in their nutritional capabilities. A weight loss smoothie is the perfect natural food. Individuals wanting to start a weight loss routine can benefit greatly from the nutritional benefits of homemade smoothies. As part of an overall plan to fight obesity, especially for those with health concerns, good nutrition from natural foods is key, and a vegetable smoothie is not only an excellent source of nutrients but is tasty as well and quite easy to prepare.